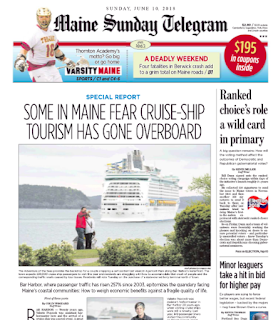 In today's Maine Sunday Telegram, I report on the apparent loss of a huge number of Maine state government emails and digital documents from the administrations of Govs. Angus King and John Baldacci. The losses, which leave holes in the state's historical memory and violate a variety of statutes, are apparently due to ad hoc actions by past information technology officials attempting to free up scarce server space. Details can be found in the story. A number of issues remain blurry, including the exact disposition of emails created by state officials between 2008 and 2016, and what proportion of pre-2008 emails and digital documents survive only on back-up storage tapes (as opposed to accessible, searchable servers.) If you have firsthand knowledge, drop me an email. In July, wrote about how a guy from Maine wound up on Vladimir Putin's list of Americans he'd like turned over for interrogation, a request he made of President Trump at this past summer's summit in Helsinki and one that - to widespread horror - Trump appeared to entertain. 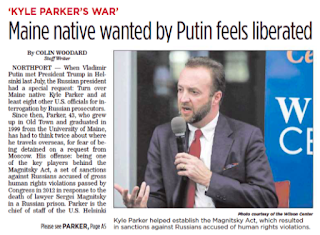 Kyle Parker, raised in Old Town, educated at the University of Maine, was back in Maine this month, speaking to the Midcoast Forum on Foreign Relations about the legislation he championed that Putin so hates: the Magnitsky Act. 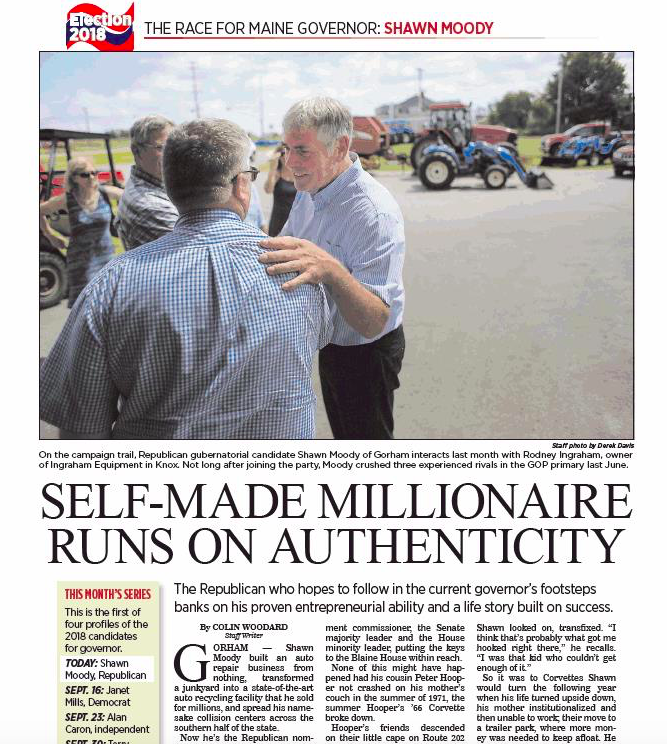 I caught up with him at the event and shared his thoughts on the Act, why it's effective, why Putin doesn't like it, and on growing up in Maine in Monday's Portland Press Herald. Last month, a coalition of West Coast fishermen filed a suit against thirty of the world's major oil companies in California Superior Court seeking damages for the latter having allegedly undermined the Dungeness crab fishery via climate change; the suit alleges Big Oil knew about the dangers of climate change for decades, but actively decided the public and decision makers. 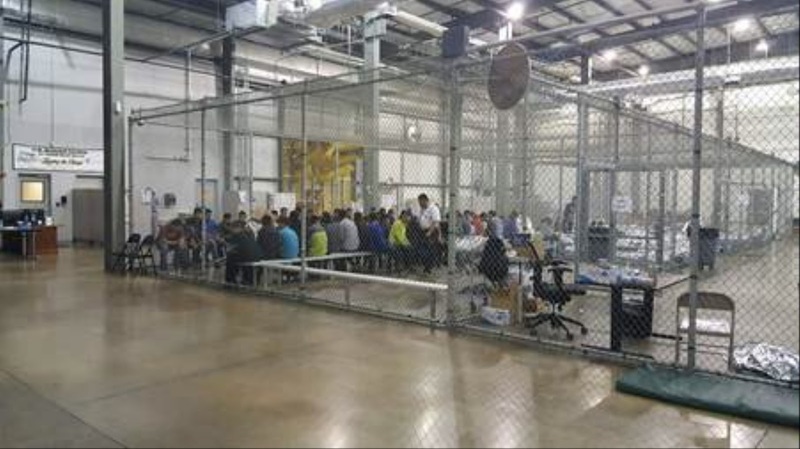 The head of the organization that filed the suit, Noah Oppenheim, is a 31-year old scientist from Maine who grew up in Falmouth and did his graduate work at the University of Maine's Darling Marine Center. 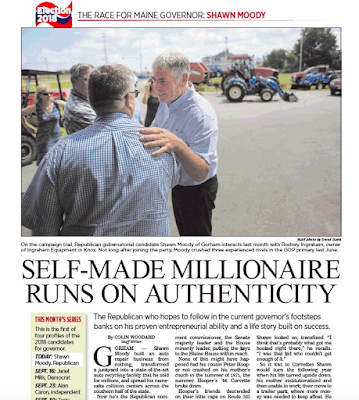 I wrote on how he found his way to the middle of this high-profile law suit in this week's Maine Sunday Telegram. Enjoy. 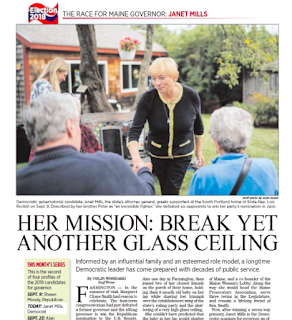 I wrote on two other Mainers at the center of national news -- Interior Department whistleblower Joel Clement and Russia expert Kyle Parker -- in the Press Herald recently. 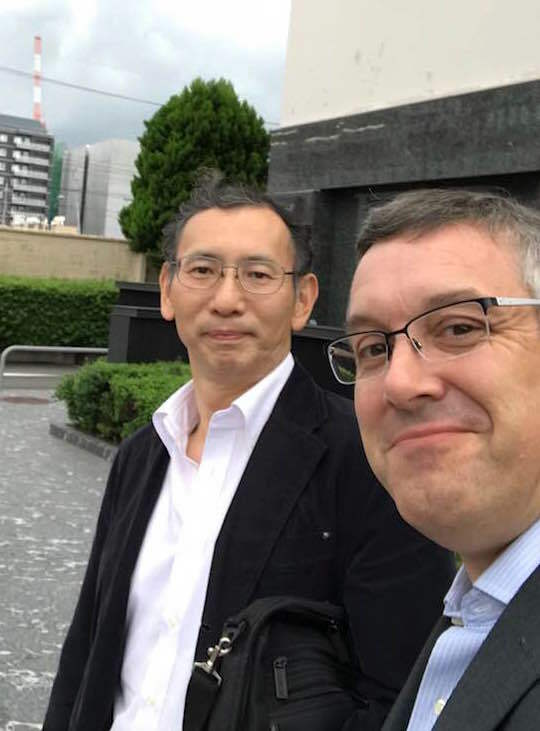 While in Tokyo, I spent an enjoyable morning at the offices of Iwanami Shoten, speaking with Rikkyo University historian Hiro Matsubara for Sekai, a leading Japanese political monthly. 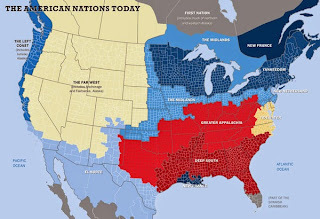 We covered a wide range of issues related to North American regionalism and American Nations. 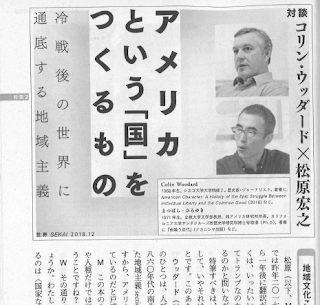 Dr. Matsubara's article is in the current issue of the magazine, for those of you who both read Japanese and subscribe. If you're part of that cohort, consider the Japanese edition of American Nations, published by Iwanami. I was in Japan to speak at the Asahi Forum, but also was able to speak to seminars at Tokyo University and Kyoto's Doshisha University, and wrote about Maine retailer L.L. 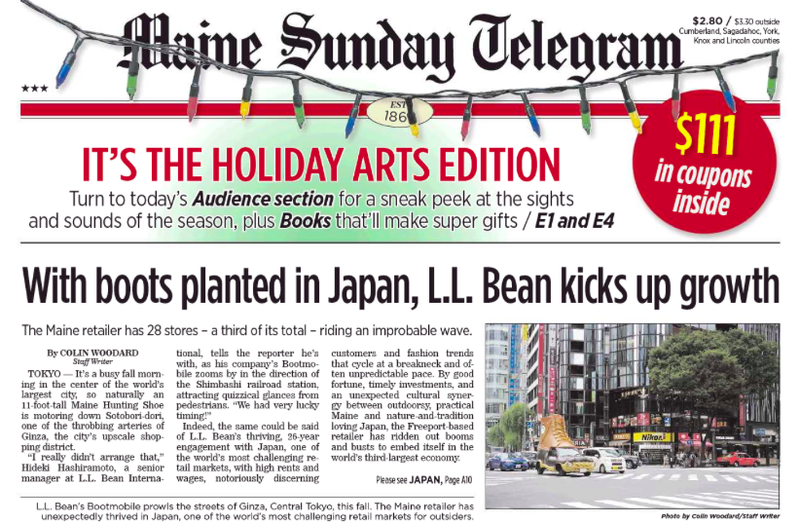 Bean's success in Japan for the Portland Press Herald. The Gulf of Maine -- already the second fastest warming part of the world's oceans -- just saw the third warmest year on the 37-year long satellite record, with average sea surface temperatures reaching levels only seen in 2012 and 2016. As I reported in yesterday's Portland Press Herald, researchers saw unpleasant effects on puffin chicks, sea turtles, and the North Atlantic's biggest kelp forest. Meanwhile, various federal and state initiatives to boost monitoring and research into the phenomenon have gone nowhere, while funding for several existing monitoring systems has withered, resulting in scientists having fewer means to track what is going on. Details in the story, but for more background start with this six-part series on the warming crisis in the Gulf, and this piece from a year ago on the state of Maine's response. President George HW Bush -- who had lifelong ties to southern Maine -- died late Friday night at age 94. 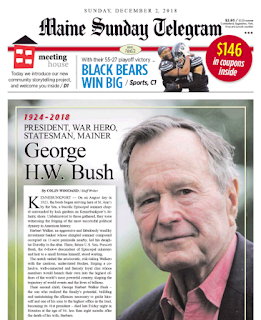 My obituary for him, the first draft of which was written some six years ago, appears in today's Maine Sunday Telegram and online here. 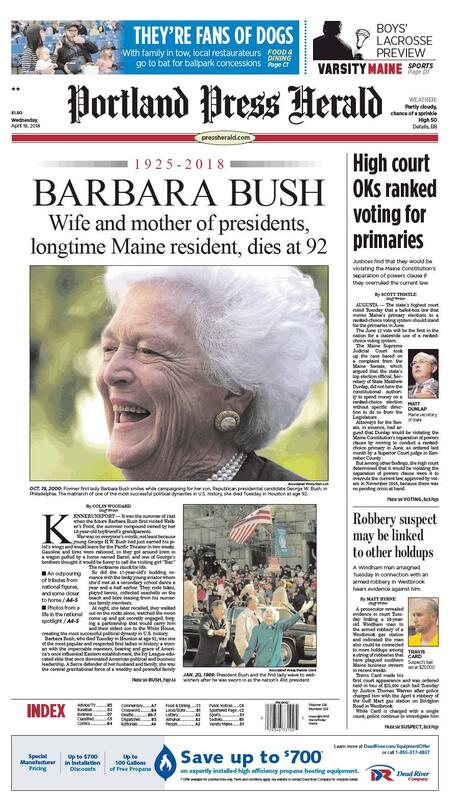 A little appreciated fact of the Bush dynasty, the most successful political one in US history, is that it was forged on the shores of Kennebunkport, with a marriage that linked the Walkers and Bushes in a vehicle capable of launching its offspring to the White House more than once. prepared for the Portland Press Herald. 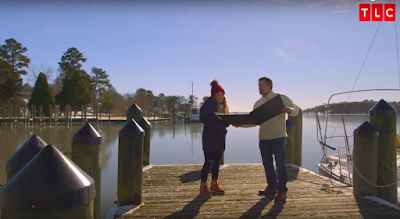 The couple identified themselves with Texas for political reasons, but through their lives Walker's Point in Kennebunkport was the only constant. They got engaged there, held weddings, family events, and high-level diplomatic events, and spent nearly every summer at the compound. It was their only home in the U.S. during the years they lived in Beijing and at the US Naval Observatory and White House. During World War II they also lived briefly in Lewiston-Auburn, while he was training at the naval air station there. Someone flagged the tweet for me -- my Twitter handle is actually @WoodardColin -- and I said I hoped he enjoys it. I'm now one of his less than 400 follows, and we engaged in a short direct message conversation about American cohesion, which shows the internet still has its occasional charms. Republic of Pirates fans take note: 2018 has been the 300th anniversary of Woodes Rogers' landing at Nassau, marking the formal -- if tumultuous and uncertain -- end of the pirate republic, and Thursday was the anniversary of Blackbeard's death in a pitched battle with sailors of the Royal Navy. I'm thankful that the New York Times opinion editors let me share my thoughts on the significance of this occasion -- and the reasons for Blackbeard's uninterrupted popularity -- in Friday's paper. 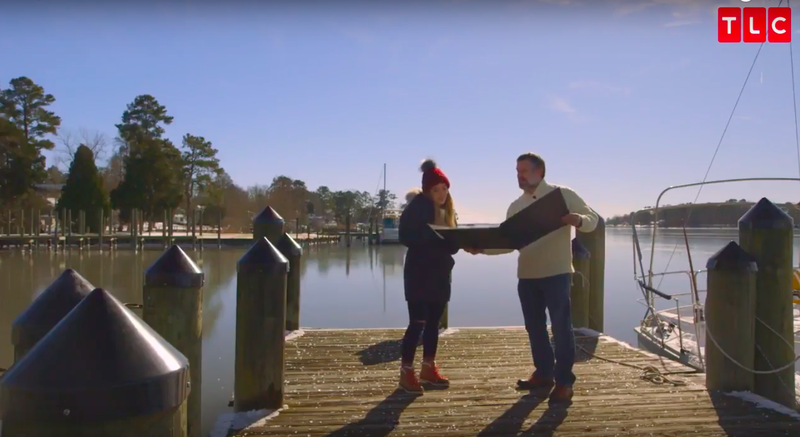 It's a nice bookend to the tricentennial, a year I started in Bath, North Carolina, talking about the pirate and his death on an iced-in dock with Rogers' unlikely descendent, actress Hilary Duff. Enjoy the piece. 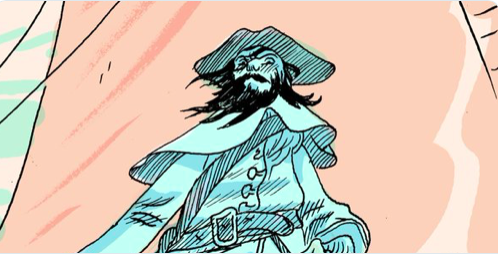 Also on Thursday back in the U.K, the Bristol Post ran this piece on Blackbeard's real name (it's Edward Thatch, not Teach) based on an interview they conducted with me a few years back. 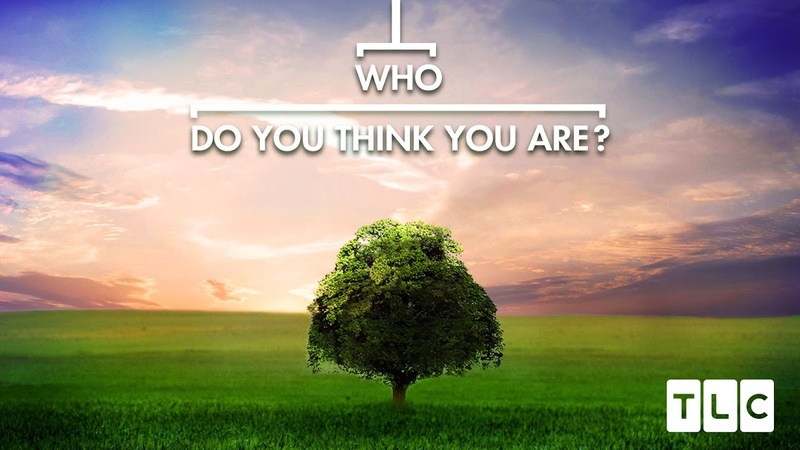 Thatch's family was from the Bristol area, even if the latest evidence -- from researcher Baylus Brooks -- indicates he himself was likely born in Jamaica. I last wrote on Blackbeard for Smithsonian a few years back, sharing new research by Mike Daniels on his final capture. I've always been curious how my hometown retailer, LL Bean, managed to succeed in Japan, one of the world's most difficult and unforgiving retail markets for foreign firms. How did the Freeport retailer wind up, back in the 1990s, opening stores in this country halfway around the world before it had even opened one anywhere else outside of Maine? How does it have 28 there now, when it hasn't yet opened one in Canada? During my recent trip to Japan, I finally had a chance to find out. 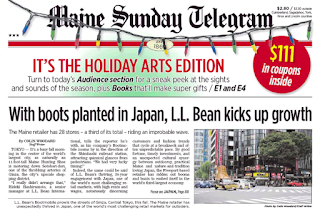 The unlikely story is in this week's Maine Sunday Telegram, and features a chance encounter with an 11 foot tall self-propelled Maine Hunting Shoe at the center of the world's largest city. 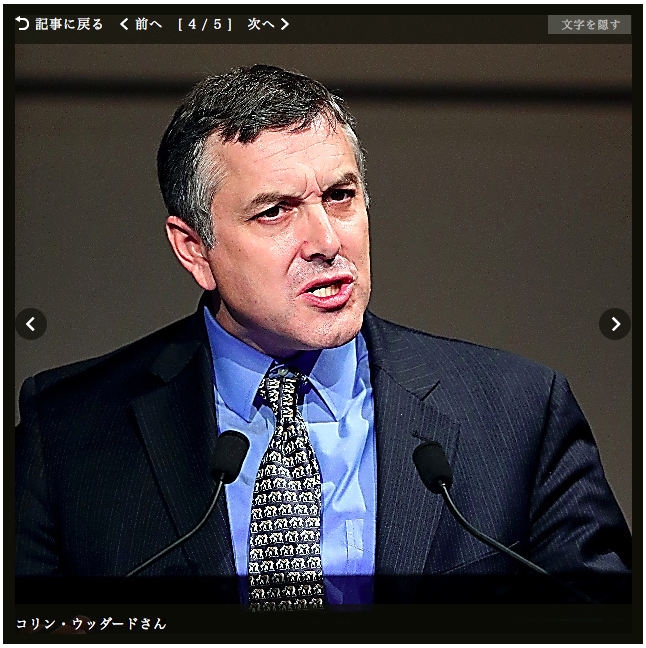 I was in Japan to present at the Asahi World Forum, the result of American Nations being released in translation there. I last wrote from Japan 12 years ago, for Grist on why that country still wants to eat whales. This month, Maine became the first state in the nation to hold its federal elections via Ranked Choice Voting, an instant runoff system intended to remove the "spoiler problem" from elections and theoretically, encourage comity and moderation in political candidates. In the state's Second U.S. House District the system was activated after none of the four candidates had a majority of first round votes, and voters made Democrat Jared Golden the winner in their second choices. 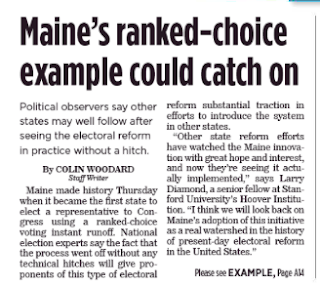 This spring, I laid out the whole saga of Maine's effort to adopt ranked choice voting for Politico Magazine, and then, for the Telegram, asked how a theoretically neutral electoral reform intended to reduce partisanship and polarization has become mired in polarization and partisanship, with Maine voters and legislators sharply split on party lines. 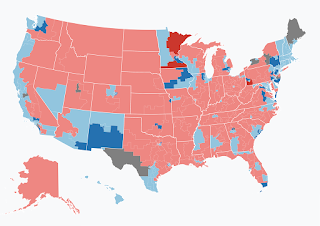 I have an expanded version of my American Nations-powered analysis of the results of 2018 midterm election here in the U.S. over at Washington Monthly. Please check it out. The rural vs urban divide and the American Nations in the past three presidential elections, in the New York Times and, with data tables and such, at Medium. The 2013 Virginia governor's race and the American Nations. The 2012 primaries and the American Nations. The 2011 off-year election and the Tea Party's problems at Washington Monthly. With most of the contests resolved, the bottom line is clear: the 2018 midterms exhibited the same regional patterning we’ve long seen in presidential contests, and represents a hardening of regional divides. Last week, this is precisely what happened. At this writing, the Democrats appear to have flipped at least 35 US House seats, and nearly half of them (16) are districts in Yankeedom, the Midlands or straddling the two, including expansive (read: not urban) places like Iowa’s first and third districts, Yankee New York’s 22nd, and, almost certainly once Ranked Choice Voting there is completed, Maine’s white, rural Maine-2, which voted for Obama twice before giving Trump one of the Pine Tree State’s Electoral College votes. Of the remaining pick-ups, 12 were in El Norte, New Netherland, Left Coast and Tidewater. Just two were in the Far West and three in the Deep South. Greater Appalachia – the largest “nation” in the country with a population of nearly 60 million – netted just one. Where did Democrats flip state legislative chambers? 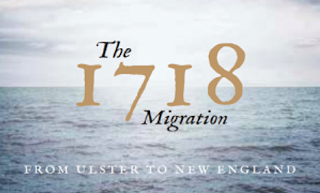 In Maine, New Hampshire, Connecticut and Minnesota – all Yankeedom -- New York (Yankeedom/New Netherland) and Colorado (Far West again.) Now state legislative control maps almost perfectly to the American Nations fissures. The 30 state houses Republicans fully control include every single state that is dominated by Deep South and Greater Appalachia, plus most of those in the Far West. Sixteen of the 18 state houses Democrats run are Yankeedom (including every chamber in New England), the Midlands, New Netherland, Left Coast and El Norte; the remaining two (Nevada and Colorado) are Far West. Today, only Minnesota has divided government. At multiple levels of government, the partisan and American Nations maps have become more closely aligned than ever, largely because the parties are more ideologically oriented than ever. Notice the only real exception to partisan sorting involves a species now extinct in Congress: genuinely moderate Republicans of the old Eisenhower/Rockefeller variety that once held sway across Yankeedom. These endangered creatures – the white rhinos of American politics – easily won reelection to the governor’s mansions in Massachusetts, New Hampshire, Vermont, and Maryland. These are encouraging signs for Democrats in 2020, in that they all point to decisive net Electoral College gains for them over the 2016 map. But they’re yet another ominous sign for the survival of our awkward federation, a place where regional divides have become frighteningly acute. I'm at the end of an enjoyable, whirlwind week in Japan. Unless, that is, the whirling winds of Typhoon Trami close Narita airport this late afternoon. I came on the invitation of the Tokyo daily, the Asahi Shimbun, to present about the American Nations paradigm and its ramifications for the rise of Trumpism at the keynote panel of their Asahi World Forum 2018. Had the pleasure of hanging around the green room for a couple of hours ahead of time with Princeton University's Jan-Werner Muller, author of What is Populism?, and Pascal Perrineau of Sciences Po, a leading expert on France's National Front. Muller, it turns out, shares my keen interest in Hungary (where I used to live and where his wife is from) and Perrineau is a regular visitor to New England, on account of a recurring visiting lectureship at Middlebury. 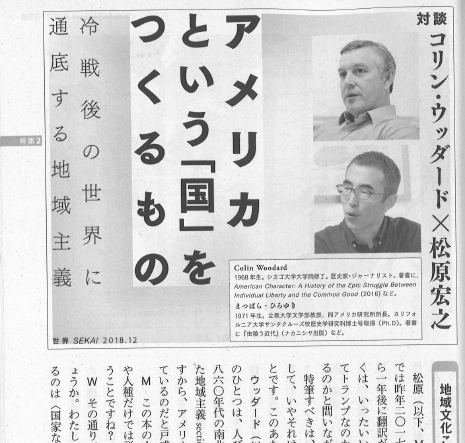 Here's Asahi Shimbun's write-up of our panel, if you read Japanese or can make sense of the Google Translate treatment of it. It ran with this dramatic photo of me making a point, probably about the Puritan conquest of Maine. 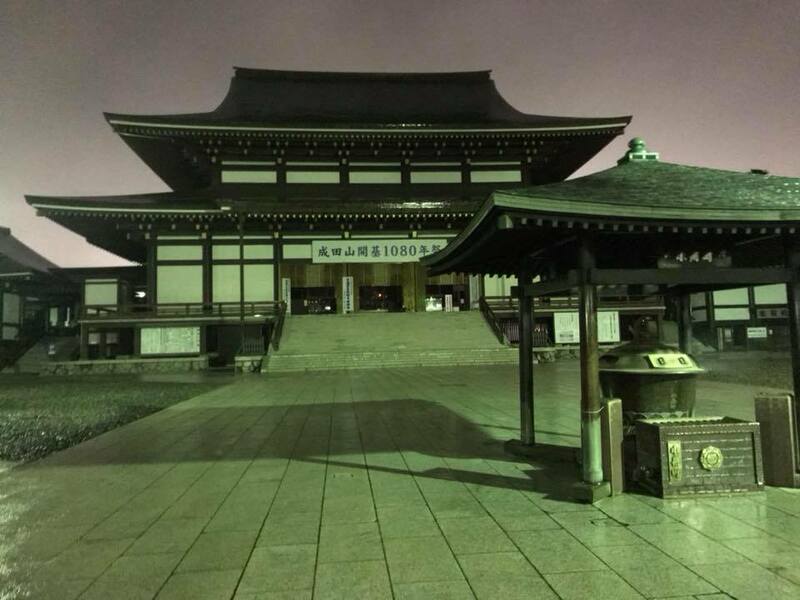 In the middle of the week, I spoke to graduate students and faculty at the University of Tokyo's Center for Pacific and American Studies on the kind invitation of Prof. Yasuo Endo, and then travelled to Kyoto where I finally met Prof. Yoshio Higomoto, who led the translation of American Nations into Japanese. I enjoyed speaking to his students and colleagues at Doshisha University which, funny enough, was founded by Yankee Congregational missionaries and has remained a leading institution in the study of the United States here, especially early American history. 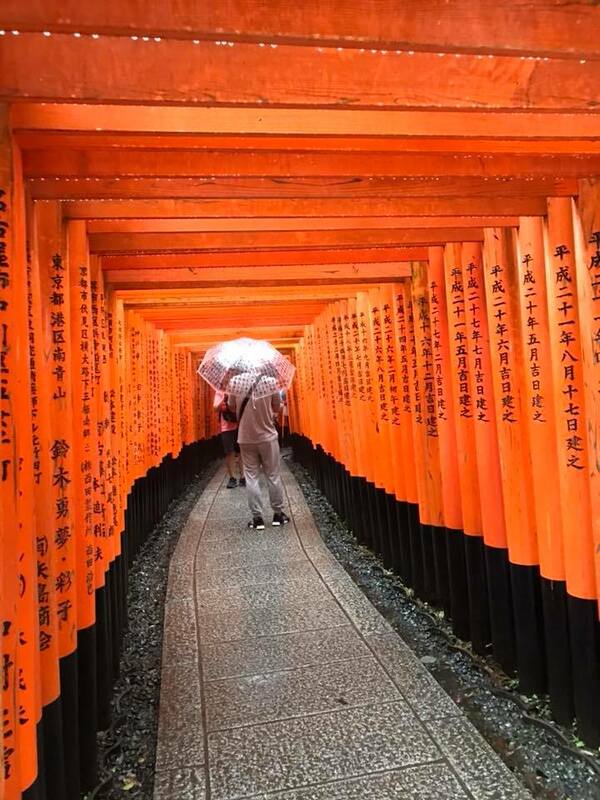 I was able to spend a beautiful day visiting the temples, mountains, and river gorges of the Kyoto area before Typhoon Trami's approach compelled my premature departure from western Japan. 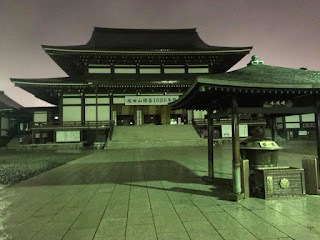 Last night I wound up in the midst of the deserted, sprawling, and beautiful hillside temple complex in the city of Narita, not far from Japan's international airport where -- fingers crossed -- my flight will be departing just as Trami begins battering the Tokyo region early this evening. 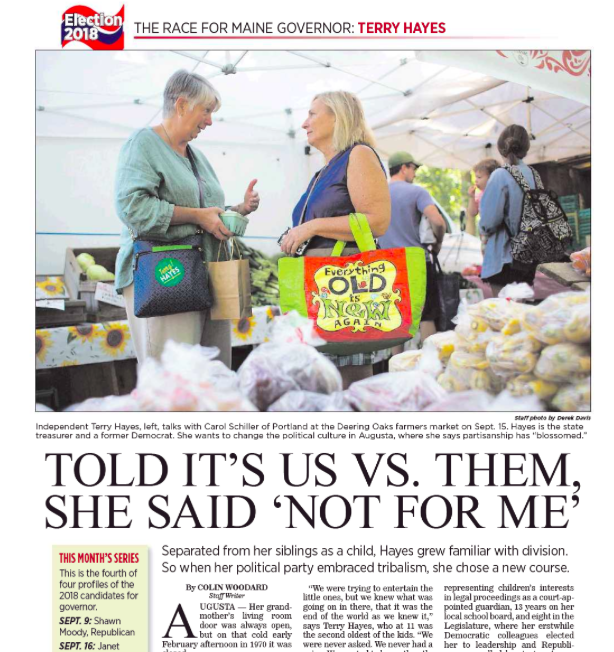 There's a four-way race to replace Maine Governor Paul LePage, and I've been writing in-depth profiles of each of the contenders for the Maine Sunday Telegram -- pieces that ask who they are, where they came from, and what shaped their world view. The latest is on one of the two independents in the race, Alan Caron, whose life has included an eight-month prison term, brushes with militant radicals, successful community organizing, a career as a leading campaign strategist and proselytizer for an innovation-led "new Maine economy." It follows last week's story on Democratic nominee Janet Mills and a one on Republican nominee Shawn Moody the week before that. The series concludes with independent Terry Hayes on Sept. 30. Iwanami Shoten, the Tokyo based publisher, released a beautifully-executed two-volume Japanese language edition of American Nations a year ago, resulting in an enjoyable in-person interview here in Maine with the New York bureau chief of the daily Asahi Shimbun a few months later. Now I'm headed to Japan to go on tour, so to speak. Like Wham!, but without George Michaels. Or music. Or the stadium-sized crowds of adoring fans. Ok, not much like that, but still fun. 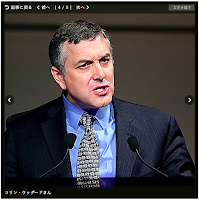 On September 25, I'll be on a keynote panel at the Asahi Forum 2018 in Tokyo, discussing the populist threat to liberal democracies with fellow presenters Pascal Perrineau (foremost researcher on France's National Front), Masaru Sato (a former intelligence analyst at the Japanese Foreign Ministry) and Princeton's Jan-Werner Muller (author of What is Populism?). If you are missing the Forum -- registration is now closed -- I will also be presenting on American Nations in two university colloquia that are open to the public. 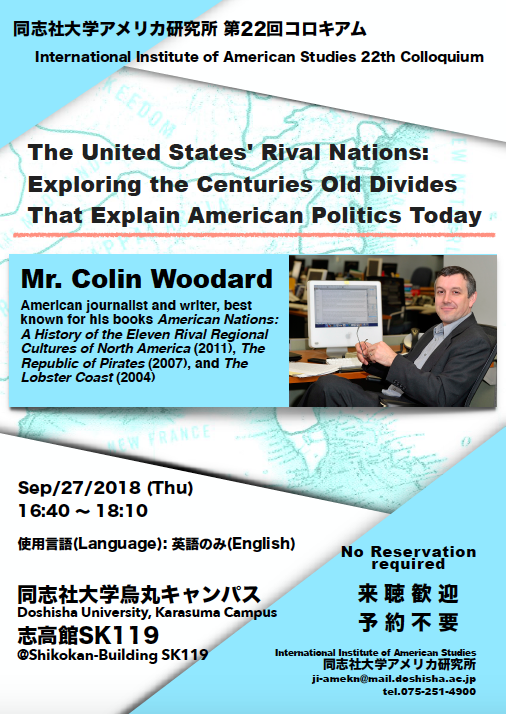 The first is September 26 at 5 pm at the University of Tokyo's Center for Pacific and American Studies, at their Kombaba campus. Details can be found here. With Paul LePage term limited, there's a competitive race for Maine Governor this fall. Over the late summer, I've been at work on a series of in-depth profiles of the four general election candidates seeking to replace him -- pieces that ask who they are, where they came from, and what shaped their world view. 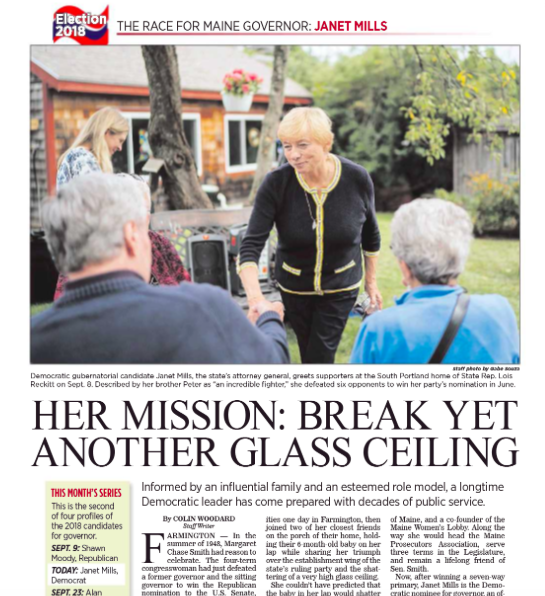 The latest is on Democratic nominee Janet Mills and appears in this week's Maine Sunday Telegram. It traces her origins in a western Maine political family closely allied to the late US Senator Margaret Chase Smith through a half-century career in public service as a criminal prosecutor, district attorney, legislator, women's rights advocate, and attorney general. I'll be speaking on coastal Maine's cultural and economic background in Blue Hill, Maine next Sunday, September 16 at the Esther Wood Room of George Stevens Academy. The talk -- entitled "Four Centuries of Coastal Maine Lives and Livelihoods" is sponsored by Colloquy Downeast in collaboration with six local partners, including the Maine Center for Coastal Fisheries the Ellsworth American, Brooklin Keeping Society, the Wilson Museum, and the Sedgwick-Brooklin Historical Society. These are themes I explore in the second of my books, The Lobster Coast: Rebels, Rusticators, and the Struggle for a Forgotten Frontier. It kicks off at 3pm. Tickets are $5 at the door and include a light reception following the talk. There's a write-up in the American this week. 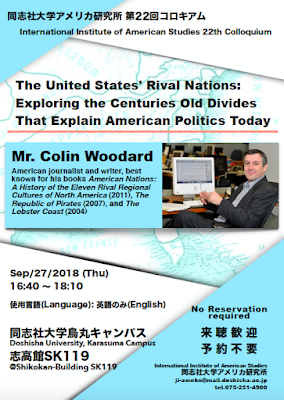 My next public talk thereafter is on the other side of the world: on American Nations at the 2018 Asahi World Forum in Tokyo September 25. Free book and a sake for anyone who makes both of these events in person. Maine's bombastic governor, Paul LePage, is term limited and leaves office early next year. Over the past six weeks I've been at work on a series of in-depth profiles of the four general election candidates seeking to replace him -- pieces that ask who they are, where they came from, and what shaped their world view. 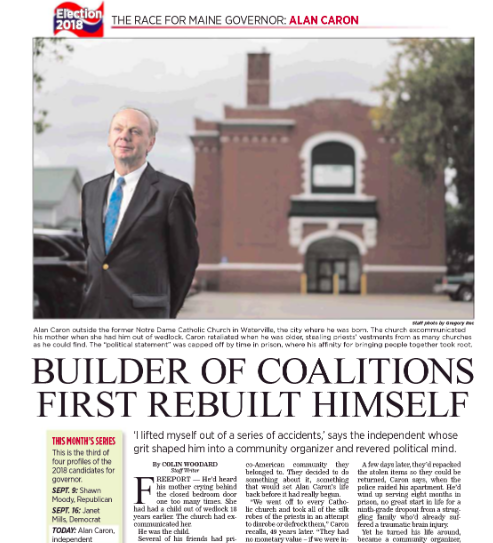 The first is on Republican nominee Shawn Moody and appears in today's Maine Sunday Telegram, tracing his ascent from the 12-year old kid left alone for a month after his mother was sent to the state mental institution to a self-made millionaire who vanquished three more experienced Republican figures to put the keys to the Blaine House within reach. 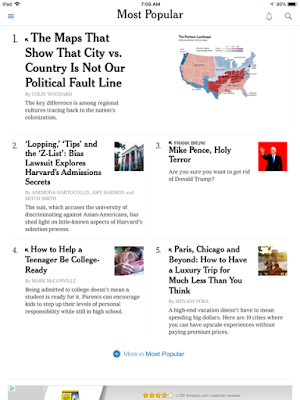 The New York Times asked me to write an opinion piece on the political implications of American Nations recently and, to my great pleasure, accepted it and built a terrific graphics package to illustrate the paradigm. The result was published yesterday at the Times and -- thank all of you -- shot up to be the most read piece on the entire site this morning. I've mentioned before the power of the colorized map in drawing people's attention on social media, and I'm doubly sure of it now. Thanks to John Guida and Bill Marsh for their time and attention. 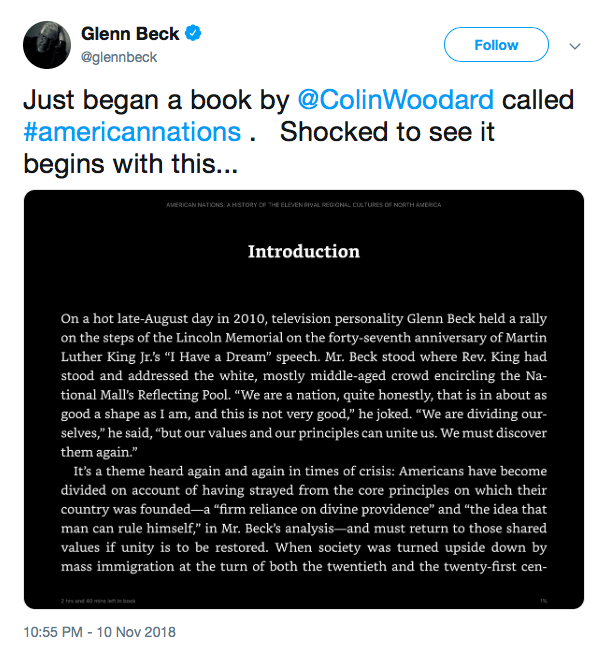 To really understand what this is all about: please do read the book. To wade in a little deeper without the book: start with this Tufts Magazine piece, which unpacks the paradigm in more detail and uses it to analyze a public policy issue -- violence and gun control -- that isn't presented in the book at all. Or, conversely, look at this Washington Monthly article to see why the (libertarian-captured) Tea Party Movement fizzled in places candidate Trump (relatively communitarian on the stump) would make inroads. To see more data on the rural vs urban issue: dig into this piece I did for Medium. For more on Trump and the 2016 election: check out this at the Portland Press Herald. To find out what's up with Alaska, Hawaii and South Florida: go here. To see me present the whole thing in detail to an audience: CSPAN's got that. To explore the central debate of our federal experience -- the proper balance between individual liberty and the common good -- consider reading American Nations' sequel, American Character. In today's Portland Press Herald, I have the story of how a guy from Maine wound up on Vladimir Putin's list of Americans he'd like turned over for interrogation, a request he made of President Trump at this week's summit in Helsinki and one that - to widespread horror - Trump appeared to entertain. 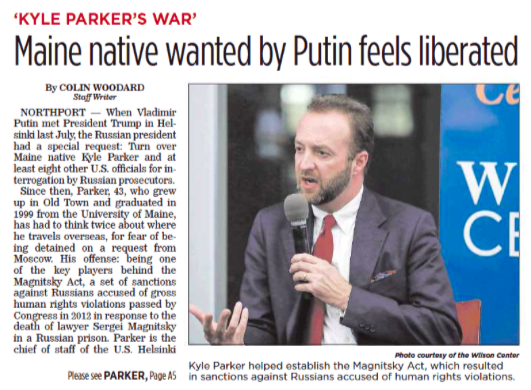 Kyle Parker, raised in Old Town, educated at the University of Maine, is a pretty big deal: the guy who by most accounts made the Magnitsky Act happen. If you don't know what that is and why Putin cares, please dig into the story, which includes an interview with Parker. For a deeper dive into Magnitsky, Parker, and Putin, I recommend this November 2017 story from GQ. Meanwhile, just to keep things strange, Maine Governor Paul LePage showed up in Montenegro earlier this month to meet with President Djukanovic, supposedly because of the Maine National Guard's 12 year old partnership with the Balkan country. LePage's office, as usual, is providing few details. The folks at Business Insider recently called to talk about what the Golden Age pirates really looked and acted like because, well, why not? The interview is up over at their website, with a produced video to illustrate the conversation. They reached out to me on account of my being the author of a detailed history of this pirate gang, The Republic of Pirates: Being the True and Surprising Story of the Caribbean Pirates and the Man Who Brought Them Down, which is available in a bunch of foreign editions - UK, Poland, Spain, Hungary, China, Taiwan, Denmark, and Brazil, if you happen to live in one of those places. Last week, Business Insider asked a bunch of Wall Street leaders what they recommended for summer reading, yielding a list of 22 books. Thanks to UBS Americas president Tom Naratil for including Republic of Pirates here as well. President Donald Trump will announce his latest nomination to the Supreme Court of the United States in a few hours, a nominee who will need 51 votes to be confirmed by the Senate. Those concerned that abortion rights will be overturned by the new court have been focused on two Republican senators who say they support reproductive rights: Lisa Murkowski of Alaska and Maine's own Susan Collins. Collins' position on Roe and the confirmation process has been consistent, but easily misunderstood for to those who don't follow her and the court closely. It's central tenant: she will judge the nominee based on their fidelity to precedent, with the assertion that this will protect Roe v Wade because it's "settled law." 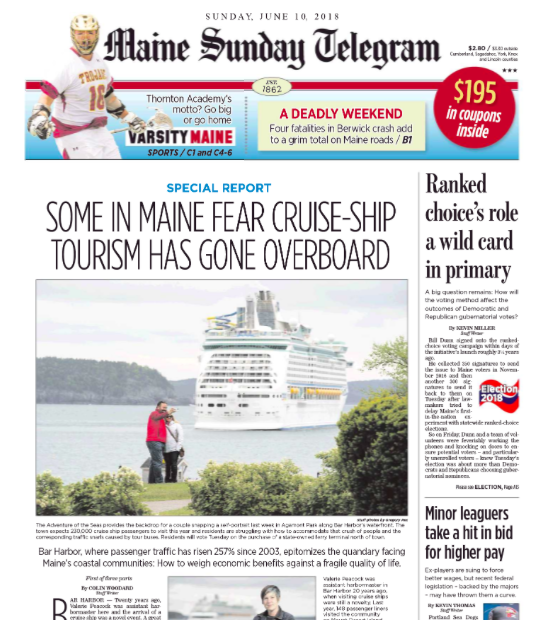 In this week's Maine Sunday Telegram, I asked several of the country's leading legal scholars what they thought of this reasoning. Most were unimpressed. Find the details here. For more on Collins' position on this issue, start here. For those of you in the Badger State: I'll be your Independence Day guest on Wisconsin Public Radio's morning program from 7 to 8 Central. Appropriately enough, I'm talking about the ideas in American Nations: A History of the Eleven Rival Regional Cultures of North America, and their implications for our history, politics, and shared stability. I've appeared on WPR a couple of times in the past, including to talk about my POLITICO Magazine story on Milwaukee's 21st century reindustraliztion drive, and another on the sequel to American Nations, American Character: A History of the Epic Struggle Between Individual Liberty and the Common Good.